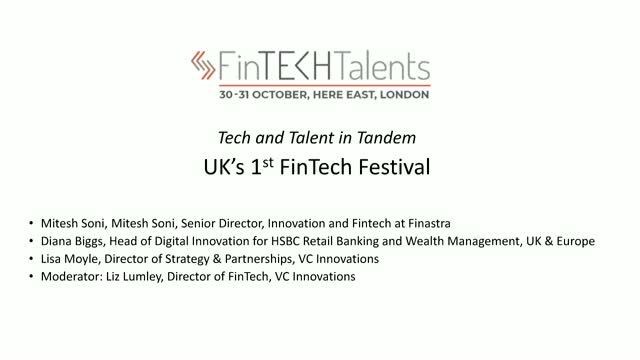 We kick off the live agenda for FinTECHTalents the UK's first FinTech festival encompassing financial institutions, FinTech startups and Universities. Join our steering committee members Mitesh Soni of Finastra and Diana Biggs of HSBC along with our director of strategy Lisa Moyle as we count down the weeks to FinTECHTalents 2018! What will the future talent pipeline mean for the future of the financial services industry? We are delighted to be joined by three leading FinTech Influencers, Diana Biggs (Head of Innovation, HSBC Retail Banking), Igor Volzhanin CEO, Datasine), and Liz Lumley (global fintech commentor and advisor) to discuss the pressing issues around access to talent and digital skills, including how best to navigate a post-Brexit world. FinTECHTalents is bringing something unique to the Financial Services space, a newly launched fintech festival developed alongside Financial Institutions, fintechs and the top computer sciences programmes to explore the fast pace of tech driven changes in the sector whilst creating a unique festival experience connecting the talent of tomorrow to the talent of today. With over 2,000 attendees representing the full ecosystem, craft beer, and live music, FinTECHTalents is already taking the scene by storm this year. Our Webinar Series will take an in-depth look at technology, innovation, and the need for sufficient talent to drive both.